Butts County Commission Chairman Roger Mc-Daniel is fond of calling his community “Georgia’s best kept secret,” an oblique reference to assets like his county’s position as a part of the Atlanta Metropolitan Statistical Area (MSA) and its manageable commute to Macon and Warner Robins Air Force Base. It could be said Butts County is proximity-blessed, giving rise to another McDaniel observation, “We believe our diamond in the rough is going to be our interchange at I-75 and Georgia Highway 16, where we currently have the Great American Travel Plaza being constructed there,” McDaniel says. “As that is finished, we’ll have a road built on the east side of that development that will eventually lead into a larger tract of land where we’re hoping the [proposed] Fieldstone will come to fruition bringing several more businesses to that area.” If McDaniel seems entirely focused on roads, he has a good reason. In Butts County, I-75 is the northern leg of an L-shaped logistics corridor that begins in the port city of Savannah on I-16, travels to Macon and turns north on I-75 past Hartsfield-Jackson Atlanta International Airport and on through Atlanta to the rest of America. If the Savannah port is deepened by 2014, as planned, Butts County will be one of dozens of counties along that route to benefit from a rise in truck traffic and the need for distribution centers along the way. It’s not like Butts County is starving for tourism and retail activity, important sources of local revenues from a one-cent sales tax. In 2008, for instance, city and county governments in Butts County earned a one percent Special Purpose Local Option Sales Tax attached to $356 million in retail sales, according to data published by the University of Georgia’s Center for Agribusiness and Economic Development. The tax income is used to improve the local quality of life and infrastructure. Butts County has a lively tourism business stimulated by the presence of two state parks, High Falls and Indian Springs, the oldest state park in the nation and one that has a lure far beyond the usual amenities. “Thousands of people come here each year to get their sulphur water, and they drink that water,” says Melinda Atha, executive director of the Butts County Chamber of Commerce. Native Americans believed it had medicinal powers, and a lot of other people still believe that. “That whole entire area at Georgia Highway 36 at I-75 has four major truck stops,” says Alan White, the former Butts County administrator and executive director of the Butts County Industrial Development Authority, who retired at the end of 2011. “You put all those truck stops together, and those truck stops not only pump gas but also have retail, and that area provides a lot of jobs for Butts and Lamar counties. “We have 1,500 acres that have been developed. There is a large employer out there called Salad Time, and there is a private driving school to train truck drivers.” An Australian catalogue company called Auscat ships goods from Down Under from its Butts County location at the Interstate. Travelers through Butts County leave $41,400 a day in local cash registers while creating 190 jobs, according to a 2009 tourism impact report published by the U.S. Travel Association (USTA). Such numbers are good news to local leaders. “It makes sense,” says County Com-mission Chairman McDaniel. “We’re the geographic center of population in the state, according to the 2000 census. Tourism dollars are some of the best dollars you can attract because you don’t have as much to spend out of that to keep going. And we’re excited about the property we have at Riverview Business Park out at I-75. We’ve got a tract of land out there, from what I’ve been told, where we could have the largest footprint south of Atlanta for a large-size industrial project. 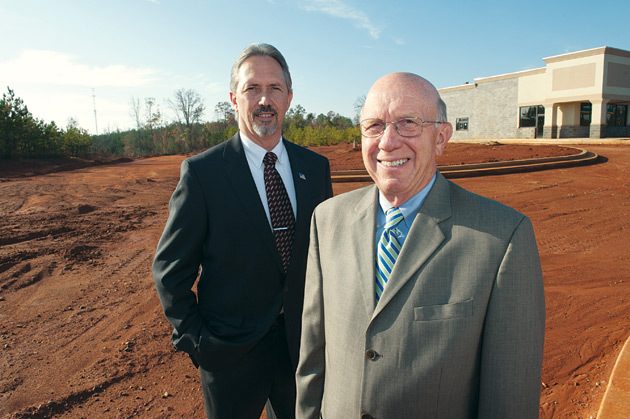 One of those steps was taken when the Butts County Industrial Devel-opment Authority joined Panattoni Development Company of Atlanta in a partnership to market 300 acres on I-75 called Riverview Business Park. Pana-ttoni partner Mike Gray says the Riverview site has the kind of unusual features that will attract attention. “It’s still a raw piece of land,” Gray says. “But we’ve done all the due diligence – infrastructure has been run to the site but not on it – and done all the off-property improvements. We’re getting it ready for development and chasing industrial build-to-suits. The Industrial Authority owns the land, and Panattoni will aid in marketing and construct a building to suit the new owner. “We’re the largest provider of industrial buildings in the United States,” Gray says. “We’ve got the capital, the expertise, the relationships to help drive the capital investment and jobs creation that will come when this site is built and goes vertical. To further sweeten the deal for prospects, the county has taken some measures to make doing business in Butts County cheaper, says McDaniel, the commission chairman. If the leaders here seem to have an inordinate interest in travelers and transportation, it is because the two subjects are part of their cultural DNA. Some of the early tourists through these parts included Andrew Jackson, who stopped for a while in 1818 on his way to do battle with the Seminole Indians, leaving behind his name for the county seat. Creek Chief William McIntosh built a resort in the county at Indian Springs in 1823, and a room at the hotel was the site where McIntosh signed away the Indian territories in Georgia to the white man, earning him death at the hands of Creek Indians who felt he had betrayed them. The popular Indian Springs is believed to be the oldest state park in the U.S. The park’s offices are in a house where President Franklin D. Roosevelt occasionally stayed during his visits to Butts County. Another park in Butts County is built with more solemn purposes in mind, says Lara Brewer, who, in November, was waiting for the arrival of an eternal flame at the Jackson Veterans Memorial Park in the downtown area so the facility could be properly christened as the newest bow to the men and women who have left Butts County for the military. The memorial recognizes those who served from the Revolutionary War to today. During the Civil War, 900 men left to serve in the Confederate Army, one of the largest percentages among Georgia counties of the day. Many here were waiting for some time to see the memorial rise from a half-acre vacant lot. “The project kind of got put on the backburner for a while,” says Brewer, the clerk of the City of Jackson. “It cost about $200,000, and this was money the mayor and council set aside over the years in the hopes we’d get it somewhere down the road.” When its owners donated the property, the deal was completed and work began. The park was dedicated November 12, the day after Veterans Day. “We’re all so happy to see it finally finished.” Brewer says. Few eateries in Georgia are more well known that Butts County’s Fresh Air Bar-B-Que, which bills itself as the state’s oldest continuously operating barbecue restaurant. The original Fresh Air opened in 1929, and there’s another one in Macon run by Butts County native George Barber, while brother David Barber looks after the one in Jackson. “Over the years, we’ve had just about every governor come in and eat,” says David Barber. “I mean from the Talmadges, Gene and Herman, down to the latest one, and I think we’ve converted the previous one.” Barber says his most frequent governor diner was Joe Frank Harris. “We had a couple from London come down here to eat during the [Atlanta] Olympics, and they came because they saw our place on the television in England.” Another couple read about Fresh Air in The New York Times and drove down from that city to see what all the fuss was about. David Barber said he believes the sauce is what attracts barbecue lovers. And the recipe for that sauce? “We keep that to ourselves,” he says. To maintain a healthy tourism industry, encourage the growth of manufacturing jobs and maintain Butts County’s reputation as a centrally located transportation hub, the Butts County Chamber of Commerce has constructed “Vision for Butts County, Georgia,” a collection of the community assets that together form “the repository of all things valued from our collective pasts,” the success story of a small county with a big future.